Drilled wells are the most common well water systems CT uses. They require sea led casing to retain their integrity and can extend as far as 1,000 feet into the earth. Drilled wells can be constructed by rotary-drilling machines or cable tool (percussion). Casing and a screen are required for drilled wells that penetrate unconsolidated material to prevent collapse and sediment inflow. The space around the casing is sealed with grouting material of bentonite clay or neat cement. This helps prevent contamination from water draining off the surface and down to the casing exterior. Driven wells are the simplest and most basic well pump CT residents use. This well type is only dug around 30 feet deep if hand-driven but can be 50 feet deep or more if machine-driven. They are constructed through the driving of a small-diameter pipe into water-bearing, shallow gravel or sand. A screened well point is usually implemented on the bottom of the casing first. These wells are the most economical to construct; however, they are only effective in shallow water and are at risk from being contaminated by surface sources due to not being sealed with grout material. The third well type is a dug well created through manual digging with a hand shovel. Historically, all wells were excavated in this manner. Digging continues past the water table until incoming water exceeds the bailing rate of the digger. Dug wells have been traditionally lined with bricks, stones, tiles, or other resilient material to prevent collapse. They are capped with wood, stone, tile, or concrete. However, due to their shallow and rudimentary nature, they are highly prone to contamination. With much better options available, dug wells are not recommended. 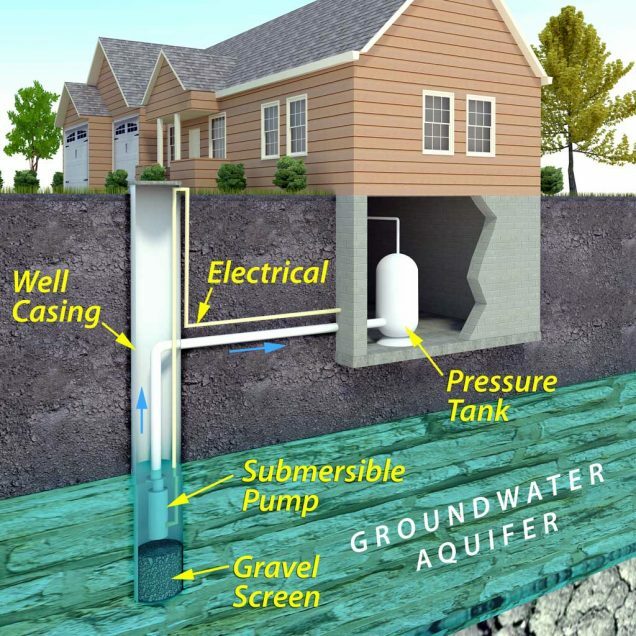 Which Type of Well is Right for Your Home? In light of construction processes, bored wells can extend much deeper under the water table than hand-dug versions. Both bored and dug wells have a large diameter, exposing a lot of water to the aquifer. These well types can obtain water from less-permeable materials like silt, clay, and fine sand. Due to their shallow nature and lack of continuous grouting and casing, these well types are subject to contamination from surface sources, giving them a disadvantage. They can also run dry during droughts, especially if the water table drops lower than the well’s bottom. For more information about well pump options in CT and well water systems CT can count on, contact Greco and Haines. We are the Connecticut Well Water Specialists who have been solving Connecticut’s well water issues since 1963. If you have an existing well water system that needs updating, replacement, or service, we can help. If you are building a brand-new home, we can assist with selecting and building the perfect new well system. Next:Do You Need To Test Your Well Water Quality?